When you find a great beach towel, everyone wants to claim it. This is one of those towels. The colors are striking, it’s big without being absurdly gigantic, and it dries fast and repels sand. What more could you ask for? 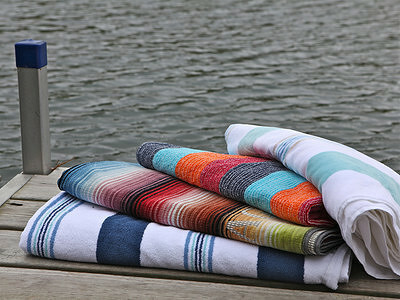 Spiaggia beach towels are made in Turkey using 100% certified-organic combed cotton. They come to us from Kassatex, a textile company led by two cousins, Ernesto and Miro Khoudari. The brightly striped Spiaggia Cabana styles are woven to feel plush without adding any extra weight – which makes for a fast drying time. The Spiaggia Ombre styles, with their graduated tones, are also “anti-sand” since the non-terry backing is designed to release sand. The toughest decision might be choosing which design you like best. After that, the challenge will be how to keep envious beach companions from trying to lay claim to your perfect towel! Hi Daily Grommet beach goers. My name is Leslie representing the Spiaggia Beach Towels. The fine organic cotton and unique construction technique of these big beautiful beach towels makes them quick to dry. It's better for your laundry and better for a day at the beach not to be stuck all day with a wet towel. The Ombre Stripe version goes a step further and is anti-sand. This summer choose the beach towel that leaves all the other towels in the sand. I am here to answer any questions that you have. What makes the reverse Anti-sand? Is there anyway of seeing a picture of the reverse? @Ellen: The back of the ombre stripe beach towels don't have the terry loops. Here is a picture. @Ellen: The design of the towels are actually woven. @Leslie Reynoso: So these are double weaves? @Ellen: I will let Leslie expand, but yes this would be a double weave. The front is woven and looped with the dyed fibers and the back is woven in a different pattern with fibers other than the ones on the front, but it is all one interconnected piece. @Ellen: Yes it is a 2-ply double weave. Perfect timing! I was just in the market for some beach towels. Love these! Just got these and love them, but don't quite understand the laundering label. How should these be washed/dried? Thank you! 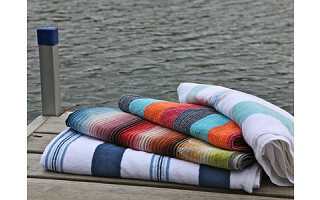 @Pamela Gross: We are glad that you love your towels! Those symbols do feel like hieroglyphics, don't they! - Maximum washing tempurature is 60 degrees Celsius, 140 degrees Fahrenheit. Hi!...so great to find Organic beach towels, but, I'm having a heck of a time trying to order. The selection feature doesn't seem to be working...Help! @Elizabeth: I will contact you directly to see if we can get this to work for you! hi, are the towels available for order yet? thanks. @Ann: There's a delay. We'll be sure to notify you when available. @Chew-Hoong OK thank you! The site says available mid-October, so I am hoping they'll be available soon? I gave the promise of the towel as a gift to my father-in-law this summer, and want to be sure to be able to deliver! The towels look great. Thanks again. @Ann: Getting get an update as to when the towels will be available. Stay tune. When you find a great beach towel, everyone wants to claim it. This is one of those towels. The colors are striking, it’s big without being absurdly gigantic, and it dries fast and repels sand. What more could you ask for? Spiaggia beach towels are made in Turkey using 100% certified-organic combed cotton. They come to us from Kassatex, a textile company led by two cousins, Ernesto and Miro Khoudari. The brightly striped Spiaggia Cabana styles are woven to feel plush without adding any extra weight – which makes for a fast drying time. The Spiaggia Ombre styles, with their graduated tones, are also “anti-sand” since the non-terry backing is designed to release sand.